This is honestly going to be a recurring theme. Few things are more frustrating when making a period recipe, than when it either turns out very different from the description, or is seemingly impossible to do. Honestly, softened or not, can you see trying to open up a modern cabbage without destroying it? And I’m not even sure how well the boiling water would penetrate the head of a modern cabbage. Cabbages have been continuously bred over the centuries to produce a tighter, more dense head, with thinner, more tender leaves. Now, possibly if you grew them yourself, you could let it mature enough to open up more. But you’re not going to find one in the grocery store like this. 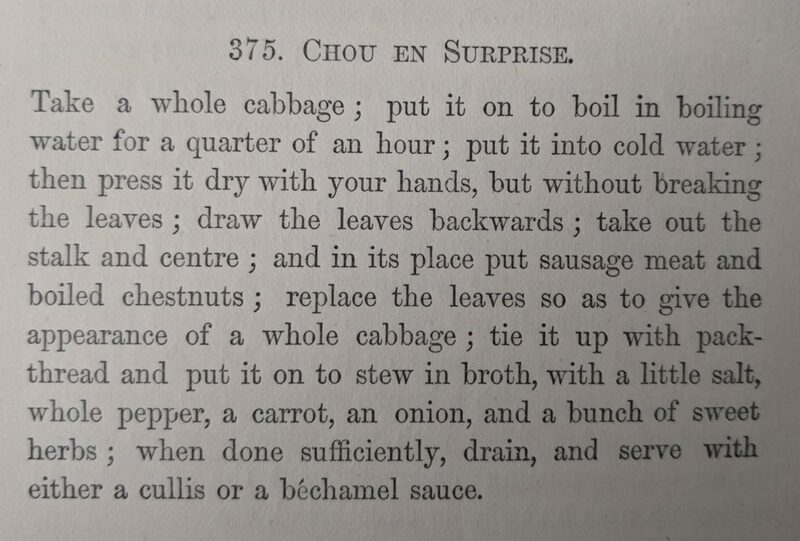 In medieval recipes, the cabbages were more likely to be completely open, no “head” at all. Additionally, from the recipes, you get the impression from the cooking times that the leaves of greens were much tougher than today’s greens. Boiling times for spinach are usually ten minutes or more, and for cabbage are often an hour or more. Granted, part of that is likely preference of the time, but still, if I cooked a modern cabbage for an hour, I’d be left with not much more than mush. Which tends to make me believe that the cabbages of then were more akin to the collard greens of today. L. H. St. Claire, Dainty Dishes, 5th ed. Edinburgh: Edmonton and Douglas, 1866.